The good folks who run the group Actor Awareness really don’t like the easy life. As well as their tireless work campaigning to open up the acting profession to those from a working class background, they also arrange ‘scratch nights’ where the viewing public get a chance to see new writing performed. Each of these nights has a theme to it and the latest, which I was lucky enough to attend was the Actor Awareness Intergenerational Night at Spotlight Theatre in the West End. The evening, hosted by a wonderful poet called Jo, consisted of four short pieces that were either stand alone or parts of a larger play. The opening play was Safe Word by Ribs Norma. In a Cambridge pub, two women, both on the wrong side of thirty five, sit having a drink. They are obviously best friends – and can therefore get away with telling each other home truths when they need to – and both are single. One of the ladies has been on an internet dating site and has started corresponding with a Swedish chap called Ulrich. So far, they haven’t met but their texts have moved from gentle flirting to the more serious stuff – such as who is your favourite Dr Who? Is this the romance of the century waiting to happen and does it just need a helping hand from a good friend to get it moving? I loved this gentle comedy and thought the writing was very strong. We’ve all been there – well I hope we have – facing that crossroads of what to do with a text friend. Do you take it that one step further and actually meet or just let the texts get more and more flirty until, no matter what the other person is like, they will never match up with expectations. Safe Word also reinforced two great truths of life. First, no matter how close you are to your best friend, never leave your phone unlocked while you go for a pee and second, there really is someone out there for everyone. So if anyone knows of a tall, good looking Swedish chap that likes science fiction – especially Dr Who – and is single, please give him my number. The second play was Our Father by Stephanie Silver and was an excerpt from a larger work. Gary and Sandra are sitting down to dinner. Sandra is very quiet and has a bandage on her left hand. Gary asks that they say grace before eating and they do. A normal dinner in a normal household? Well no, for underneath Gary’s affability is a man who has two beliefs that affect his entire way of thinking and acting. The first is that his wife is always looking at and desiring other men and the second is that he has been sent by God to help Sandra and her daughter Jess to be better people. Unfortunately, his methods are distinctly Old Testament and the ‘normal’ family meal quickly turns into a night of terror. When someone says that something was not easy to watch, it is often a bit of an exaggeration. However in the case of Our Father it was not just difficult to watch, there were times I had to look away from the story unfolding before me. Not only was the writing absolutely superb in every way but the acting was truly fantastic. This play was so realistic, that there actually seemed to be an aura of evil and untapped rage around Gary even when he was doing nothing. However the biggest shout out for acting I’ve ever given has to go to Sarah Dent in the role of Sandra. Her performance was amazing and so realistic, I was moved to tears. This was acting of the highest calibre and I feel privileged to have witnessed it. After the interval, and a chance to get over the first half, things kicked off with Joan and Olivia by Nicola Amory. Olivia is an elderly woman who has just gone through a traumatic experience. She was mugged outside her home. She is being comforted by her son’s girlfriend, Olivia, but this is not much help as Joan really doesn’t like Olivia and feels she is the wrong person for her son in every way. Joan and Olivia was an interesting play in the way it examined how age, and background play such a large part in fixing people’s ideas about things such as racism and political correctness. Within the writing there is a lot of realism. In fact it pains me to say I’ve had way too similar conversations with my parents as Olivia had with Joan, and met the same entrenched ideas and thought processes. In fact I did wonder at one point if the writer had slipped into my parents house one night and listened to them talking. Having said that. Whilst the initial reaction is to be irritated by Joan and her attitudes, it is difficult not to feel for her in some way as she has seen the world around her change so much from the one she thought she knew. Both actors were great in their roles and at the end of quite an emotional piece , I think the line that resonated so much for me was “blame the person not the whole world” which is a wonderful motto to live by. The evening ended with Michelle Payne’s Robbing Class a lively little comedy about two sisters, Rosie and Lucy and their new BFF, Bianca. The piece starts out with a monologue from Rosie to the police about why she steals. Her reasoning makes a lot of sense and really comes down to a mixture of jealousy for the life of the ‘richos’ and necessity to survive in a city like London where ‘normal’ people are priced out of areas that are up and coming or being gentrified, but who still have to come into central to work at minimum wage jobs. The action then moves to Rosie and Lucy’s home where Rosie has brought a new member of the team – the non-English speaking Bianca – who she met whilst they both tried to rob the same house. Rosie has decided to take Bianca under her wing and form a robbing partnership with her. At first sight, Robbing Class seems like a fairly standard play about a poor working class person robbing the rich. In fact, it is nothing of the sort. Rosie justifies what she does in an impassioned speech that had me tempted to leave the doors unlocked at home. She knows what she is doing is wrong but she is a true professional who takes pride in her work. Her affection for and need to protect her sister is highly visible and warming to the heart to see. In fact, the relationship between the girls (and the actresses) really feels warm and genuine. I could imagine Rosie being happy to let someone like Rumplestiltskin join the gang if he provided protection for Lucy. So, once again the Tom Stocks and the Actor Awareness team put on a truly fantastic and inspired evening of theatrical entertainment. Four very different plays were presented and each one worked on every level possible with fantastic writing, directing and acting in every case. My favourite – because I disliked it so much – was our Father which was not only the stand out show of the evening but served as a perfect reminder of the true power of theatre to move people. Too often audiences seem to think that theatre is just an extension of film – keep an eye out for Disney’s Finding Dory on a stage near you LOL – but the reality is that being in a small performing space with real live human beings just there in front of you can have more of an effect on the emotions than millions of pounds spent on some glitzy west end show. I’m really looking forward to the next Scratch night. 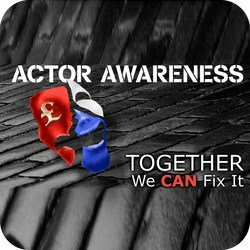 The Actor Awareness campaign run by Tom Stocks, it’s a campaign fighting to have more equality, diversity and working class actors in the industry, no matter your background or financial restraints.